The Midge Hadley doll is Barbie dolls best friend, is 11 1/2" tall and was introduced in 1963, Midge is the same size and shape as Barbie so she can share her extensive wardrobe but . . . not her man, as the Allan doll is her boyfriend. The titian Midge originally wore a chartreuse and orange two piece knit swimsuit, blonde Midge's swimsuit is in two shades of blue and the brunette Midge wore a pink and red swimsuit. Straight legs, blonde, brunette or titian saran hair, hard plastic body, blue centered eyes, freckles, (some have teeth), two piece nylon swimsuit (see above for correct hair and swimsuit colors), white open toe heels, and black wire stand. There are rare dolls that have side glancing eyes or eyes of colors other than blue and this would make the values higher. Doll mark: Midge T.M. 1962 Barbie 1958 by Mattel, Inc.
1964-1966 Midge doll - the same doll as 1963 with the word "Patented" added as a last line on the markings. 1967 Midge doll - same doll as 1966. Bendable legs, new shorter hair style in blonde, titian, or brunette, new multi-color one-piece striped swimsuit, turquoise open toe heels, blue ribbon hair band, new gold wire stand. (some intaglio markings as Miss Barbie). Doll mark: (engraved) 1958 Mattel, Inc. U.S. Patented U.S. Pat. Pend. 1966-1967 Midge doll - same as 1965, added to markings last line (raised print) Made in Japan. Late in 1966 all the markings were raised instead of part engraved. 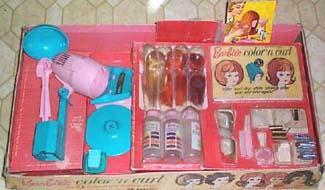 One molded Barbie doll head with blue headband, one molded Midge doll head with orange headband, four wigs, wig stand, battery operated hair dryer, color changer solution and miscellaneous hair items. There are other sets on Barbie's page, but this is the only one that featured the molded head Midge. One molded Midge doll head with orange headband, three wigs; titian pigtails, blonde swirl n curl, brunette topknot pouf. 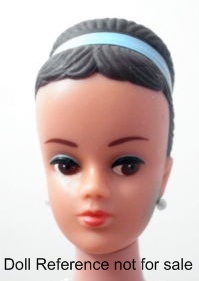 Available only in the Japan market, the New Midge came with molded brown hair with a center part and no bangs, has a blue molded, painted headband, brown side glancing painted eyes, no freckles, straight non-bending legs and body as the USA Midge doll. She looks very different than the USA sold Midge doll. 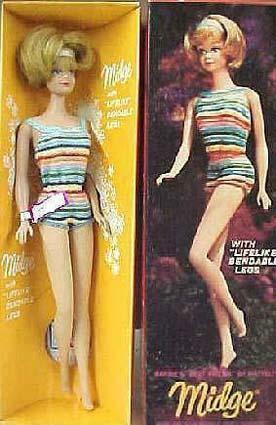 Note: Mattel's Midge doll was discontinued from 1968 until the late 1980s in the USA market.